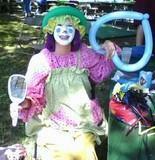 We offer clowns that come to your party! Clowns are a great addition to your Bounce House. They will twist Balloon animals and also do face painting. Always a hit at any party! A 1 hour service can accomodate up to 25 kids. You have an option of how the entertainer is dressed. They can come dressed silly with no make-up -or- they can come to the party in full make up as a clown. Price listed is for 1 hour, multiple hour discounts. Call for details Must call in advance for booking and availability.